Bear Rock Electric, Inc. (BRE) is proud to offer to our customers, Generac’s HomeLink™, the upgradeable manual transfer switch. 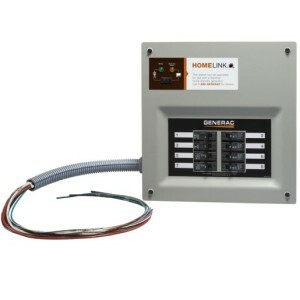 HomeLink™ makes upgrading from a portable generator to automatic standby power simple and affordable. With some simple rewiring, your Generac-certified BRE electrician is able to install this revolutionary transfer switch next to your existing breaker panel, which can house anywhere from 8 to 10 circuits of the homeowner’s choice, such as the microwave, furnace, sump pump, and other utility-powered devices throughout the home. Once the electrician has finished making the selected connections, the wires are safely capped and tucked into main panel, and a breaker is installed in the main panel, which is supplied by your BRE electrician and matches the existing house panel. As quick as that, your home is now wired for HomeLink™. The raceway for generator wiring is then attached leading to the chosen location of the power inlet box, which is now ready for hook-up to your portable generator. Generac composite cabling is then installed, routed, and tucked away until needed. This cable gives you, the homeowner the option of a quick and simple conversion to a fully automatic standby solution at any point in the future. Once the transfer switch is connected to the breaker panel and configured to your portable generator and our electrician has fastened the cover, the HomeLink Manual Automatic Transfer Switch – the first of its kind – is now operational. Once the generator is plugged in, the amber light on the transfer switch illuminates, indicating that the generator is active. With an easy flick of the switch, you can transfer over to immediate generator power. Once the outage is over, the green light indicates that you are ready to switch back to utility power. For an even more hand-off approach to back up power, you can upgrade to a permanent home standby solution. Using some of the wiring already installed, you BRE electrician can replace the manual switch with a fully automatic one. Now, you do not have to worry about the lights and manual switch, which are gone with this new panel. During the next outage, the generator will automatically power the chosen appliances with NO user interaction necessary. BRE’s expertise in Generac power systems and all aspects of emergency preparedness has been of great help to our customers, residential and commercial alike. Call us to find out more about how we can help you for your emergency power needs: (888) 688-9927.